The class represents rotated (i.e. not up-right) rectangles on a plane. Each rectangle is specified by the center point (mass center), length of each side (represented by cv::Size2f structure) and the rotation angle in degrees. center The rectangle mass center. size Width and height of the rectangle. angle The rotation angle in a clockwise direction. 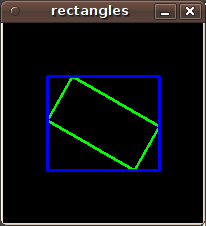 When the angle is 0, 90, 180, 270 etc., the rectangle becomes an up-right rectangle. Any 3 end points of the RotatedRect. They must be given in order (either clockwise or anticlockwise). pts The points array for storing rectangle vertices.